They are used as antioxidizing of organic polymers benzofuran-2-onic and/or indolin-2-onic compounds which present in the position 3, either at least one hydrogen atom, or an organic remains bound by a double binding to the rest of the molecule, and/or optionally substituted bis-3-benzofuran-2-onic compounds and/or optionally substituted bis-3-indolin-2-onic compounds. 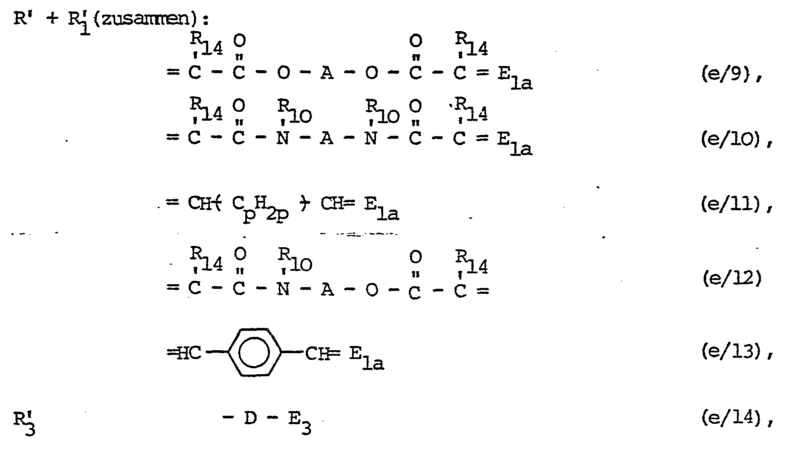 These compounds having the following characteristics: (i) The benzofuran-2(3H)-onic compounds unsubstituted in the position 3 having in the position 5 no hydroxyl esterically inhibited by a tert. 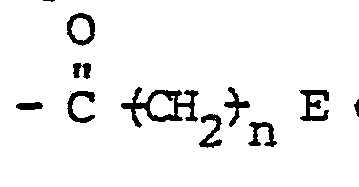 butyl group; (ii) the indolin-2-onic compounds, in as much as in these compounds the nitrogen atom (1-) is bound to a hydrogen atom or to an alkyl or aralkyl group and only the position 3 has an additional substituent, wherein this additional substituent has no acetamidic structure; (iii) the polymer organic material being substantially free of halogen when 3- acyl-benzofuran-2-onic compounds are used. The invention relates also to polymer materials stabilized in this manner. New benzofuran-2-onic and indolin-2-onic compounds are disclosed which present in the molecule thereof at least two benzofuran-2-onic and indolin-2-onic cores; These cores are connected either directly in their position 5, or bridged by means of an organic remains in position 3-. 5- or 7. Indolinone (2) compounds as stabilizers in polymeric organic materials. In particular, the invention relates to the use of benzofuranone (2) compounds and / or indolinone (2) compounds having in the 3-position either at least one Wasserstoffatcm or bound via a double bond organic radical, and / or optionally s-ubstituierte bis-3 -benzofuranone (2) compounds and / or optionally substituted bis-3-indolinone (2) compounds as stabilizers for organic polymeric F-aterials, wcbei (i) in the 3-position unsubstituted benzofuran-2 (3H) -one compounds in 5- no position by tert. have butyl sterically hindered hydroxyl, (ii) compounds which indolinone (2), in that its (1) nitrogen atom of hydrogen, alkyl or aralkyl and if only the 3-position carries a further substituent having this no Acetamidstruktur and (iii) with the use of 3-acyl--benzofuranone (2) en the polymeric organic material is substantially free of halogen. is bound or is (are). nuclear indolinone (2), (ii) in compounds 2 is directly bonded to one another benzofuranone (2) - or indolinone (2) cores comprise (residues (a / 1), (a / 3), (a / 7) and the directly bonded radical e 3, and (iii) compounds of the above a bridge member (residues (e / 1) to (e / 15)) bound two or more benzofuranone (2) - or indolinone (2) have core. As a result, the groups (i) and (ii) are first treated together. tuiertes phenyl, preferably phenyl. R 1 as substituted phenyl is preferably free of chlorine. R 1 is substituted as the phenyl radical by hydroxyl, as located on this in the para position, preferably 1 alkyl group. (C 1-4). and the other Wasserstoffj preferably both hydrogen. fabric or alkyl (C 1-12), preferably hydrogen. 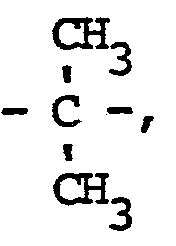 Methyl, tert-butyl, tert-amyl, preferably tert-butyl. Preferably, none of the means ± Sι ιstituenten R 2, R 3, R 4 or R 5 is hydroxyl. Preferably, the compound is free of nitro groups. R 17 is independently hydrogen or alkyl (C 1-4). X is preferably X ', ie, oxygen, -NH-, -N (alkyl [1-12 C]) -, or -N (C 6 H 5) -, preferably oxygen, -N (alkyl [C 1-4] ) - or -N (C 6 H 5) -; preferably oxygen or -N (C 6 H 5) -, preferably oxygen. X is not oxygen, then R 1 is preferably optionally substituted phenyl. Means as R 1 is preferably different from (a / 5). 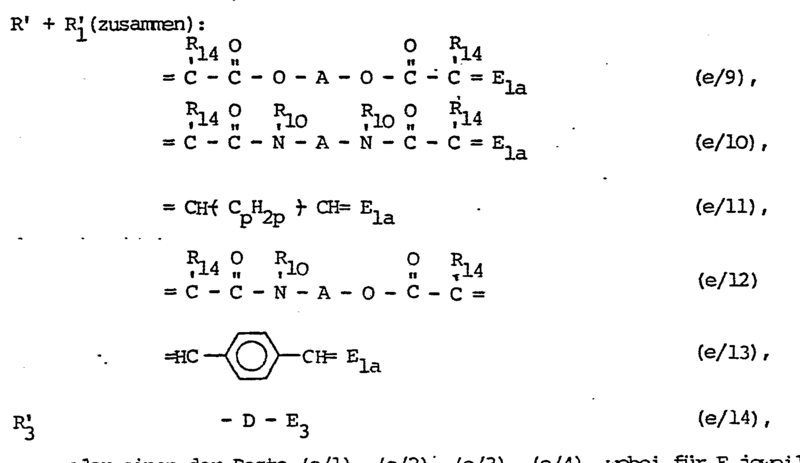 R 6 and optionally substituted phenyl, preferably optionally substituted by 1 or 2 alkyl (C 1-12) zusaimen radicals having at most 16 carbon atoms, substituted phenyl, hydroxyphenyl or 3,5-di-tert-butyl-4-hydroxyphenyl, preferably optionally substituted by 1 alkyl (C 1-12) substituted phenyl or 3,5-di-tert-butyl-4-hydroxyphenyl, preferably phenyl. with Cyclöhexyliden, preferably hydrogen. R 6a as alkyl preferably has 1-8, preferably 1-4 carbon atoms and is preferably methyl. 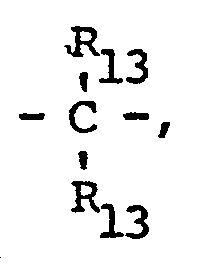 the radical (b / 2), R 11 is preferably phenyl. R 11 as alkyl preferably has 1-17 carbon atoms. Is a radical (b / 2) are present, this is preferably in the 5-position, wcbei is - hydrogen when R 11 is different - the adjacent hydroxyl group is preferably located in the 6-position. R 12 is preferably alkyl (C 1-12), phenyl or 4-alkyl (C 1-9) phenyl. n is preferably 1 or 2, preferably 2. n in (a / 4) or (a / 5) for R 1 is preferably 1, and R 3 preferably 2. R 14 is preferably hydrogen. Cycloalkyl or alkylcycloalkyl are preferably each cyclohexyl or Msthylcyclohexyl, preferably cyclohexyl. 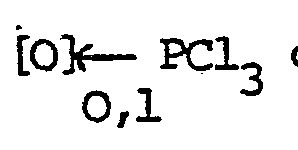 preferably (f / 17) and (f / 18), wcbei are indicated in parentheses adjacent atoms (or group) in formulas (f / 15) to (f / 20). wcbei the free valencies are linked to oxygen. preferably - S - or preferably - CH 2 -. Alkyl (C 1-4) or one of R 13 is a radical (a / 4) wherein R 7 is a monovalent radical, preferably hydrogen or alkyl (1-4C), preferably methyl. 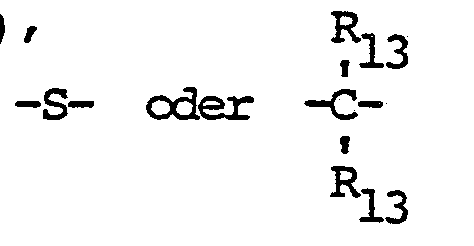 Of the compounds of group (iii), preferred are those having each via a bridge member bound 1, 2, or 3, vorzugssräise 1 or 3, preferably 1 radicals E. Of these, again those compounds are preferred which exhibit the radicals E 1, E 3 or E 5, preferably the radicals E 1 or E 3, preferably the radicals E. 3 is preferably different from (E / 15). 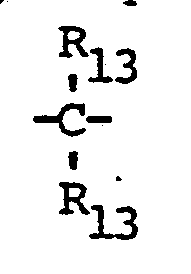 Of the compounds of group (ii), preferred are those in which R represents a radical (a / 1), or R 3 is a radical E 3, preferably those in which R 1 is optionally substituted phenyl. Vcn the compounds of group (iii), preferred are those which correspond to the cbigen definition of formula (I'a), with the restriction that the connection is always one of the radicals (e / 1), (E / 6), (e / 7 have), (e / 8), (e / 9) or (E / 14). the VeriDindungen are preferred geπöss the definition (I "a) which have one of these bridge members, and particularly those compounds according to the definition (I" 'a). the compounds having a radical (e / 1), (E / 6), preferably (e / 1) are preferred according to, preferably in 5-position. Many compounds of the groups (i) and (ii) are known. Insofar as they are nich known, they can be prepared in an analogous Vfeise. E is 5 and n = 1, or (s / 15) where R 1 = optionally substituted phenyl (e / 4) where E =. is reacted with piperazine: in a known manner or is (e / 4). As functional derivatives of the acid group especially the acid chloride or the lower alkyl esters were eligible. is reacted in a known per se Vfeise and hydrogenating the resulting intermediate catalytic. 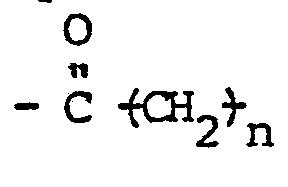 Alkyl esters or (e / 7) and (e / 8), the acid chlorides. The procedure for the preparation of compounds of formula (II) wherein R + R 1 zusaimen one of the radicals (e / 9), (e / 10) (E / 11), (e / 12), (e / 13) mean, is characterized in that a Veώindung of formula (I) wherein R and R 1 is hydrogen, is reacted with the corresponding aldehydes of the bridge member. wherein R 1 is optionally substituted phenyl, is condensed in known manner. R 3a and R 5a cbigen the meanings of R 3 or R 5 have a secondary with the exception that no residual (a / 5) is present and in a allfällig present radical (a / 4) R 4 only hydrogen, and G amine radical or halogen, is heated with at least the equivalent amount of cyanide ions and condenses the product obtained in the presence of water in hydrolyzed per se known manner and with the phenolic hydroxyl group with elimination of water, and then, provided that R 7 may be different in the final product by hydrogen, or radical (a / 5) to be achieved, with the corresponding alcohol esterified amidated barren the corresponding amine. G as halogen is preferably chlorine or bromine, preferably chlorine. As cyanide used is preferably an alkali or alkaline earth metal cyanide, preferably sodium or potassium cyanide. The present invention also relates to polymeric organic materials comprising a benzofuranone (2) compound and / or indolinone (2) compound in 3-position either have at least one hydrogen atom, or bonded via a Dcppelbindung organic radical and / or optionally substituted bis- 3-benzofuranone (2) compounds and / or optionally substituted bis-3-indolinone (2) compounds, wcfoei in the 3-position unsubstituted benzofuran-2 (3H) σnverbindungen in 5-position by tert no. have butyl sterically hindered hydroxyl and indolinone (2) compounds, in that its (1) nitrogen atom of hydrogen, alkyl or aralkyl and if only the 3-position carries a further substituent having this no Acetamidstruktur and when the polymeric material is a 3 acyl benzofurancn (2) containing compound as a stabilizer, this is substantially halogen-free. In addition, the invention also relates to a process for stabilizing polymeric organic materials against thermal oxidative, photo-oxidative and which occurs due to mechanical stress during the processing of Polymerschirelzen degradation, characterized in that in this a benzofuranone (2) compound and / or indolinone is (2 ) compound having in the 3-position either at least one hydrogen breath or bound via a double-bindving organic radical and / or an optionally substituted bis-3-benzofuranone (2) compound and / or an optionally substituted bis-3-indolinone (2) compound in webei 3-substituted benzofuran-2 (3H) -one compounds in the 5-position by tert no. Butyl comprise sterically hindered hydroxyl and Indolincn (2) compounds, in that its (1) nitrogen atom of hydrogen, alkyl or aralkyl and if only the 3-position carries a further substituent, that does not have Acetamidstruktur before, during or after the polymerization brings. The compounds used to protect the polymeric substances from thermal, photooxydativem and thermomechanical degradation. The Msnge the introduced protective agent may vary within wide limits, for example between 0.01 and 5%, preferably between 0.02 and 1% based on the material to be protected. Particularly preferred is a method of stabilizing polymeric organic materials just mentioned, in which the erfindungsgeitässen benzofuranone (2) compounds and / or indolinone (2) compounds, additional additives for improving the properties of the polymeric organic materials are added. These other auxiliaries may be either antioxidants based on sterically hindered phenols, or sulfur - or phosphorous - containing co-stabilizers, or a mixture of suitable sterically hindered phenols, and sulfur and / or phosphorus-containing compounds. Polyethylene, including high molecular weight polyethylene, ethylene / propylene copolymers, polyvinyl chloride, polyester, polyamide, polyurethanes, polyacrylonitrile, ABS terpolymers, terpolymers of Acrylester, styrene and acrylonitrile, copolymers vcn styrene and acrylonitrile or styrene and butadiene, preferably polypropylene, polyethylene ethylene / propylene copolymer or ABS. It can also be stabilized natural materials such as rubber, as well as lubricating oils. The incorporation or coating of the materials to be protected by known methods. A particularly important application process is the intimate mixing of a plastic with the novel compounds in the melt, for example in a kneader ode by extrusion, injection molding, blow molding, spinning to relevant articles. Preference is given to a polypropylene or polyethylene in granular form, Griesheim or powder form. The inventive benzofuranone (2) - and / or indolinone (2) compounds, and their above-mentioned mixtures can also be used in the presence of further additives. 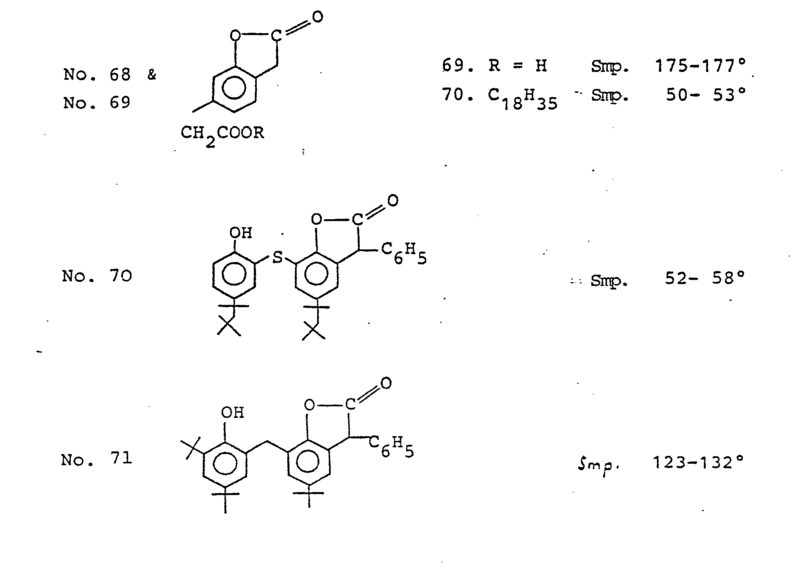 Such are known per se and described for example in DOS 2606 358th These include, for example to the group of amino aryl compounds, the UV absorbers and light stabilizers such as 2- (2'-hydroxyphenyl) benzotriazoles, 2-Hydroxybenzcphencne, 1,3-bis (2'-hydroxybenzcyl) benzenes, salicylates, cinnamic acid esters, esters of optionally vcn siibstituierten benzoic acids, hindered amines, Oxalsäurediamiede. In addition, the claimed compounds may also zusaimen with Matalldesaktivatoren, for example N, N'-Dibenzoylhydrazid, N-benzoyl-N'-Salicylcylhydrazid, N, N'-Distearylhydrazid, N, N-bis [3- (3,5 ditert. -butyl-4-hydroxyphenyl) -propionyl] -hydrazide, N, N'-Bissaucylcylhydrazid, Oxalylbis- (benzylidenehydrazide), N, N-bis (3-methoxy-2-naphthcyl-) hydrazide, N, N'-di-α . are used -phenoxybutyloxy (isophthalyl dihydrazide among others. Other additives are-for example, flame retardants, antistatic agents and other additives known per se. The invention also relates antioxydativ acting means to stabilize vcn polymers, characterized in that it comprises a Benzofuranin (2) compound and / or indoline (2) compound having in the 3-position either at least one hydrogen breath or bound via a double bond organic radical and / or an optionally substituted bis-3-benzofuranone (2) compound and / or an optionally substituted bis-3-indolinone (2) compound. Such means are known, for example as masterbatches and comprise, for example 5-90%, vorzugswsise 20-60%, preferably 20-30% of the benzofuranone (2) - and / or indolinone (2) compounds in a polymeric organic material. The inventive benzofuranone (2) - and / or can indolinone compounds (2) zusaimengeschmolzen with suitable sterically hindered phenols and / or light stabilizers and / or metal deactivators and are ground after cooling the melt. A thus produced additive mixture has the great advantage over a mixture of different additive powders physikalsichen that a separation of the individual components due to different grain size, density, Adsorpticnskräften, static electricity and other conceivable physical properties is no longer possible. At the same time, a suitable optical brightener, such as [(1,2 d) triazol-2-yl 2H-naphtho] -3-phenylcoumarin bestiimen 7- melted down, so you can by simple measurement of the fluorescence intensity, the concentration of added additive mixture as the relative fluorescence intensity is over a relatively wide concentration range of the optical brightener linear to the concentration of the additive mixture, which is incorporated in a polymer in relationship. Thus, the use of fabricated via the melt additive mixtures in addition to the advantage of the homogeneity additive also brings an efficient and rapid production control in the stabilization of plastics, since this simple measurement of fluorescence intensity, for example, can be carried out directly on the Produkticnsextruder. The invention therefore also relates to the use of a ground melt of the inventive compounds zusaimem with suitable phenolic antioxidants and, optionally, suitable light stabilizers, metal deactivators, Nukleirungsmitteln and lubricants as well as an optical brightener for optimum distribution of the additive components in the polymer and the ease of determining the additive content by measuring the intensity of which is caused by the present optical brighteners äurch UV irradiation fluorescence radiation, as well as the ground melt itself. In the following examples, parts are by weight and the percentages are by weight. Temperatures are given in degrees Celsius. The structures were confirmed by microanalysis and spectroscopic data. 15.2 g of mandelic acid and 20.6 g of 2,4-di-tert-butylpherol be zusaimengegeben and heated under a nitrogen atmosphere for about 20 hours at 185 °. The water formed during the reaction is distilled off. After cooling to solve the Reaktiσnsgemisch in ether and then extracted first with aqueous sodium bicarbonate solution with water. After evaporation of the solvent and recrystallization from methanol 4 of Table 1 obtained white crystals of Schirelzbereich 113-114 ° as the compound no.. If one instead of 2,4-di-tert-butylphenol in the above example, phenol, p-cresol, m-tert-butylphenol, p-tert-butylphenol, 3,5-dimethylphenol, 2,4-di-tert .-butyl-5-methylphenol, 2,4-di-tert-amylphenol, 2,4-di-methylphenol, 3- (4-hydroxyphenyl) propionate, 2,5-di-tert-butylphenol, m- cresol, 4-phenylphenol, 2-phenylphenol, Resorcinmonomethyläther, resorcinol, stearic acid-3-hydroxyphenyl ester, methyl 4-hydroxybenzoate, 2-tert-butylphenol, o-cresol, 2,4-dihydroxybenzophenone, 4-hydroxybenzoic acid, 2,2-bis - (4-hydroxyphenyl) propane, beta-naphthol, the diester of 1,5-pentanediol and 3- (4-hydroxyphenyl) -propicnsäure, resorcinol, 2,4-dihydroxybenzoic acid, and converts these compounds in an analogous manner or with 1 . 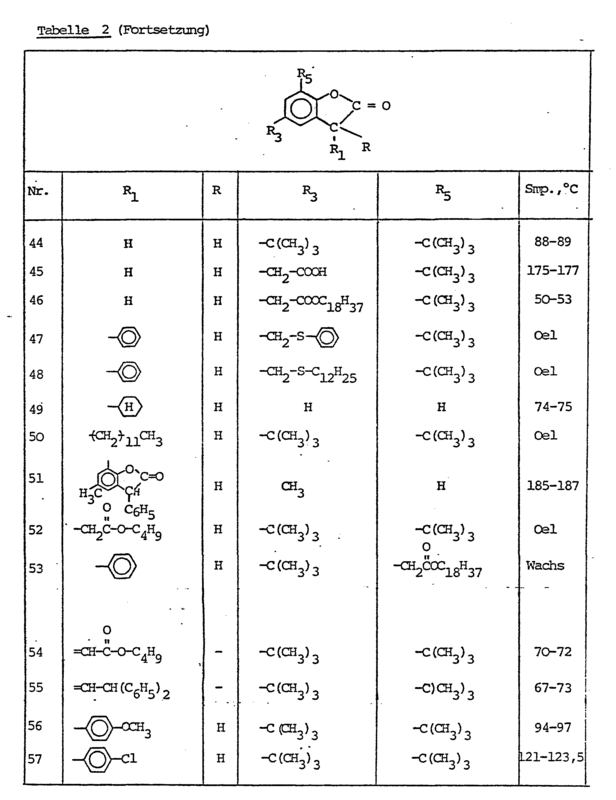 2 equivalents hfendelsäure to, one obtains the compounds 1-3, 5-20, 22-28 of Table 1.
. Compound No. 17 is obtained by esterification of the compound No. 16 using stearoyl chloride. compound no. 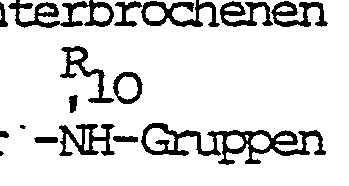 21 by esterification of the compound no. 20 with stearyl alcohol in a conventional manner. Ether dissolved parts, the ether solution washed with water, dried over Glauber's salt and then evaporated. After recrystallization from methanol to obtain white crystals having a melting range of 74-75 °, of compound no. 30 of Table 1. Compounds Nos. are prepared analogously as compound no. 30 31 Table 1 and no. 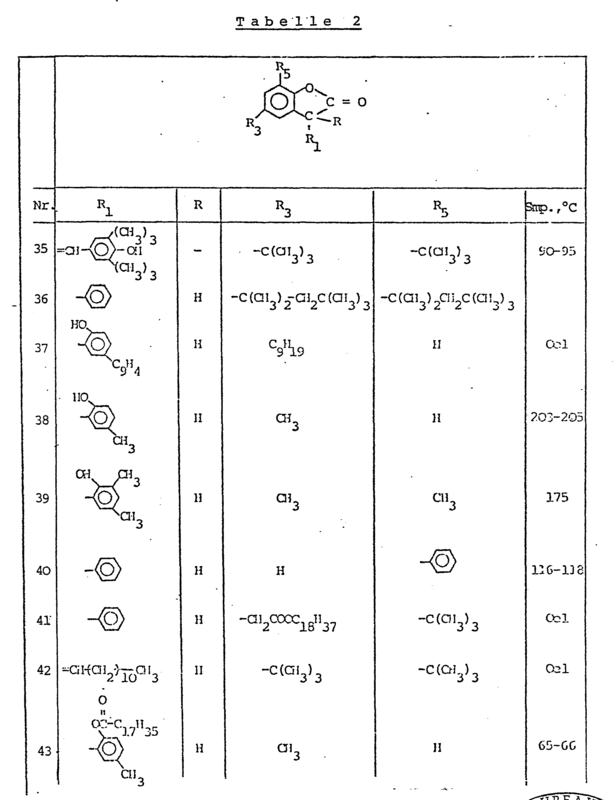 35 and 42 of Table 2.
diethylene glycol monomethyl ether are dissolved in 450 parts. These are whom 39 parts of potassium cyanide and 6 parts of potassium iodide. In a Teirperatur of 80 ° C are slowly hinzutrcpfen 63 parts water. Then, the temperature of the reaction mixture is increased to 130 ° C and stirred at this temperature for 16 hours. After cooling to room temperature are added 1000 parts of ice water. Upon careful acidification with hydrochloric acid (HCN evolution) a precipitate forms which dissolves again after adding 400 parts of ether. The org. Phase is separated, washed with water, dried over MgSO 4 and evaporated. The residue is mixed with toluene, er¬hitzt to boiling for about 1 hour. Here, condensation water deposits. After evaporation of the solvent and recrystallization from a little methanol 88-89 ° C to obtain colorless crystals of melting range corresponding to the compound No.44 of the Table 2 below. Example 7 (Compound # 61). Terephthaldehyde, 024 parts of piperidine benzoate and 100 parts of toluene is heated for 15 h at reflux temperature. After evaporation of the solvent is recrystallized from acetone. The crystals thus obtained are washed with little ice-cold ether and dried. Aspect. Yellow powder with a melting range 241-242 ° C, the structure of Compound No. is the same as for the 61. Example 8 (Compound # 62). 2.0 parts of pentaerythritol tetra [3- (4-hydroxy-phenyl) propionate] and 2.1 parts of mandelic acid zusaimen be heated to 180 ° C for 23 hours. After cooling, the Reakticnsgemisch chrcϊratograjhisch (9 volumes of toluene and 1 volume of acetone, silica gel, eluant) is separated. This gives a product of melting range 90-95 ° C, whose analytical data (JR, NMR) with the structure of compound no. 62 are in line. 1.60 parts of compound no. 61 wsrden catalytically hydrogenated at room temperature and under normal pressure. As the solvent used, 20 parts of glacial acetic acid as catalyst, take 0.2 part of palladium on barium sulfate. After removal of the catalyst and the solvent, the residue is taken up in ether. The ethereal solution is then extracted by shaking first with sodium bicarbonate solution with water, dried over MgSO 4 and evaporated. The residue has a melting range of 258-259 ° (petroleum ether) and corresponds to the structure of the compound. No. 60. A mixture of 1200 Tteilen a commercially available unstabilized polypropylene (Profax 6501), 0.6 part of calcium stearate, 0.6 Tteilen tetrakis [methylene-3 (3'5'-di-tert-butyl-4'-hydroxyphenyl) propionate] - methane, and 0.6 part of compound no. 4 of Table 1 are thoroughly mixed in a shaker for 10 minutes and in an extruder with a temperature profile of 150-240-260-200 ° in the individual heating zones and 120 U / min. extruded into a strand which is pelletized after passing through a water bath. The obtained granulate is extruded a further 9 times and granulated, wherein one part is entnαmen for determining the Melt Flow Index (MET according to ASTM D 1238 L, 230 ° C; 2.16 kp), which as a measure of the thermomechanical oxidative Deσradation of the polymer serves. In the same way, a mixture is extruded, which does not contain a benzofuranone. Manner is achieved an excellent improvement in the melt stability even in ethylene-propylene copolymers. 100 parts of unstabilized polyethylene powder HD (Phillips type) are mixed with 0.02 parts of compound no. 5, Table 1 and 0.01 part of tetrakis [methylene-3- (3'5-di-tert-butyl-4 hydroxyphenyl) propionate] methane stabilized. The powder is subjected to a ircdifizierten MET test at 230 ° / 0.325 kg on a Davenport MFI device. With a special tool, the powder is pressed into the heated steel cylinder, the normal punch fitted with the 325 g weight and tapped the polymer pressed out to the nozzle after exactly 60 second intervals. The samples obtained were not counting on grams / 10 minutes. The stronger the cross-linking of the polyethylene of insufficient stabilization, the lower of the thus calculated value is MFI. After 5-15 minutes a constant attendant has set. Between different formulations of certain 25 minutes MFI is chosen. by stabilizing with the above mixture very good values ​​are obtained. Analogously, the compounds listed other used. To 100 parts of commercial suspension FVC (K value 60) in a fluid mixer (Papemreier TEHK8 type) 1.0 parts of octyl stearate, 1.5 parts of Ba-Cd stabilizer (powdered) and 1 part of compound no. 4 Table 1 and 0.5 parts of a commercial Arylalkylphosphates mixed until the temperature has risen to 110 ° C. The thus homogenized mixture is pressed on a roll mill at 180 ° C, for 5 minutes processed into a sheet at 200 ° C for 1.5 minutes at 2 atm, and 1.5 minutes at 20 atm to 1 mm thick plates. The test specimens prepared therefrom were 30 minutes to thermal stress in a forced air oven at 180 ° C. A comparative sample, containing no material of the compound 4 and instead of 1.5 parts of Ba-Cd stabilizer contains 2.5 parts, is discolored more both initially and after 30 minutes of exposure. 300 parts of ABS powder (Fa. Marbon AOE 301075) are dissolved in 2200 parts of chloroform and added dropwise to this solution to 8000 parts of methanol, wherein the ABS fails. After filtration, the thus freed from the stabilizer system ABS overnight at room temperature in a vacuum is freed from the solvent mixture. 100 parts destabilized ABS powder are dissolved in 750 parts of chloroform and treated with 0.2 Tteilen the compound Nos. 10 and stirred for 15 minutes under nitrogen. With a 1 mm doctor blade, the .Lösung is drawn subsequently on a glass plate to the film and the solvent allowed to evaporate, wherein a kcirpakter about 150 μ thin film remains which is freed in vacuo overnight at Raumteιτperatur of last Iösungsmittelresten. The specimens prepared from these films are stored in an out convection oven at 95 °. their aging resistance is checked by IR measurement repeated until Δε = 0.4 at 1715 cm. It turns out that the samples that compound no. 10 included, have much longer furnace life, compared to specimens containing no additive. Additional (50%) occurring both a lower yellowing tendency during the irradiation and substantially longer residence times in the same Weatherometer to decrease the biting strength by irradiation due to fiber damage. 1000 parts of a 20% styrene-butadiene emulsion is added to the solution while stirring with a hydrochloric acid, 5% NaCl, wherein the rubber coagulated. At a pH of 3.5 for 1 hour, stirring is continued. The coagulum is washed several times after filtration and dried at room temperature in a vacuum drying cabinet for Gswichtskonstanz. 25 parts of the rubber thus obtained are heated under nitrogen in BrabenderPlastographen to 125 ° and mixed with 0:25 parts of compound no. 26, Table 1, for 10 minutes and then compressed to give 0.5 mm thick sheets at 125 °. The test pieces produced therefrom are irradiated in Atlas Weatherometer at intervals of 24 hours. The comparison of the yellowing (yellowness index) with material containing no stabilizer, is a significantly better light stability of the stabilized. Material. Calcium stearate and 0.02 parts of the optical brightener 7- [2H-naphtho (1,2 d) triazol-2-yl] -3-phenyl coumarin heated under inert gas to 160 ° C, the mixture melts under stirring. The melt obtained is poured into a flat dish and ground after cooling. The free-flowing material thus prepared melted at 70-75 ° C.
Plastic bag by repeatedly shaking mixed. 43 parts of this powder mixture are heated in a Brabender Plasti-Corder PLV 151 to 220 rpm at 50 ° C and the course of the torque registered to a significant decrease. The polymer is better stabilized by the added Mditivmischung than in a comparative experiment in which twice the amount of a 1: 1 mixture of tetrakis [methylene-3- (3 ', 5'-di-tert-butγl-4'-hydroxyphenyl ) propionate] methane. and 2,6 di-tert-butyl-4-methylphenol was added. Various concentrations of the above melt mixture blended into polyethylene or polypropylene powder and processed by extrusion into a strand, which is subsequently granulated, the relative fluorescence intensity can be measured with a fluorescence spectrophotometer by the incorporated optical brightener. Diess fluorescence intensity is in the Konzentraticnsbereich of 0.01 to 1 ppm brightener in the polymer linearly with the concentration of the melt mixture. Thereby, the content of additive can be determined in the polymer granules by a simple measurement of the fluorescence intensity. compounds 1. Use of benzofuranone (2) and / or indolinone (2) compounds having in the 3-position either at least one Wasserstoffatαm or bound via a double bond organic radical, and / or optionally substituted bis-3-benzo furanone (2 ) compounds and / or optionally substituted bis-3-indolinone (2) compounds as stabilizers for organic polymeric materials, wherein (i) (in the 3-position unsubstituted benzofuran-2 3H) -one compounds in the 5-position by not tert. have butyl sterically hindered hydroxyl, (ii) compounds which indolinone (2), in that its (1) nitrogen atom of hydrogen, alkyl or aralkyl and if only the 3-position carries a further substituent having this no Acetamidstruktur and (iii) when using 3-acyl--benzofuranone (2) en vcn the polymeric organic material in vßsentlichen is halogen free. 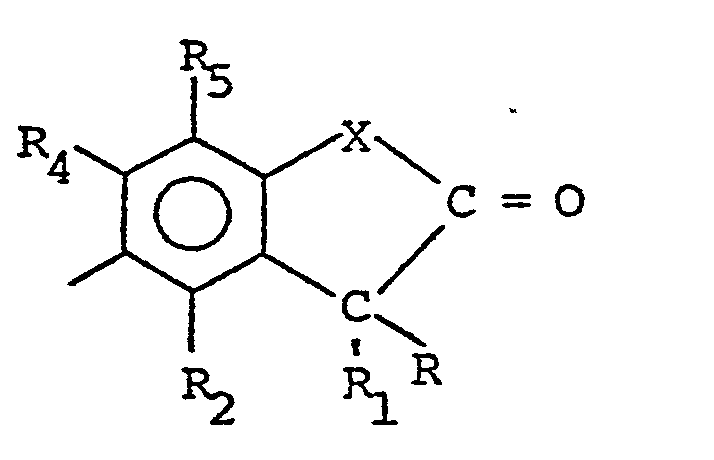 whose bridging oxygen is bonded in the 5- or 6-position, or R 4 and R 5 together are tetramethylene, or a solid (b / 1), the bridging oxygen is bonded in the 6- or 7-position, wherein when a residual (b / is 1) present, more X is oxygen, X is oxygen, or a (substituted by hydrogen, alkyl C 1-18), CycloalkylBenzyl, (C 5.6) alkyl (C 1-5) cycloalkyl (C 5.6) or optionally substituted phenyl, substituted nitrogen, wherein the molecule as a substituent at most one directly bonded benzofuranone (2) - or indolinone (2) - moiety has, and if neither R 1 nor R 3 alone or R 1 together with R a directly bonded radical a benzofuranone (2) - or indolinone (2) - form connection: one of the substituents R 1, R 2, R 3, R 4 or R 5 or R 1 zusaimen may also form a suitable bridge member R, which further residues of a benzofuranone (2) - and / or indolinone (2) - compound, which in the 3-position at least one hydrogen atom or a practice r have a double bond bonded organic radical, can carry, and in addition, the unsubstituted in the 3-position benzofuranone-2 (3H) compounds in the 5-position by tert-butyl not have sterically hindered hydroxyl and indolinone (2) compounds inasmuch their (1-) Stickstoffatcm is bonded to hydrogen, alkyl or aralkyl, and only the 3-position carries a further substituent, that does not have Acetamidstruktur. E or rounds is (are). together with R 2 form a fused benzene radical, hydrogen or alkyl (C 1-12), alkyl (C 1-8) mean. wherein optionally substituted with 1 alkyl (C 1-4) substituted phenyl, hydrogen or alkyl (C 1-9), alkyl (C 1-5) mean. 8. Use according to claims 1-3 of compounds containing a single benzofuranone (2) - or indolinone (2) have core. 9. Vervendung according to claims 1-3 of Veibindungen, the two directly bonded to one another benzofuranone (2) - or have indolinone (2) cores. comprise or indolinone (2) cores - 10. Vervendung according to claims 1-3 of compounds bound via a bridge member, two or more benzofuranone (2). 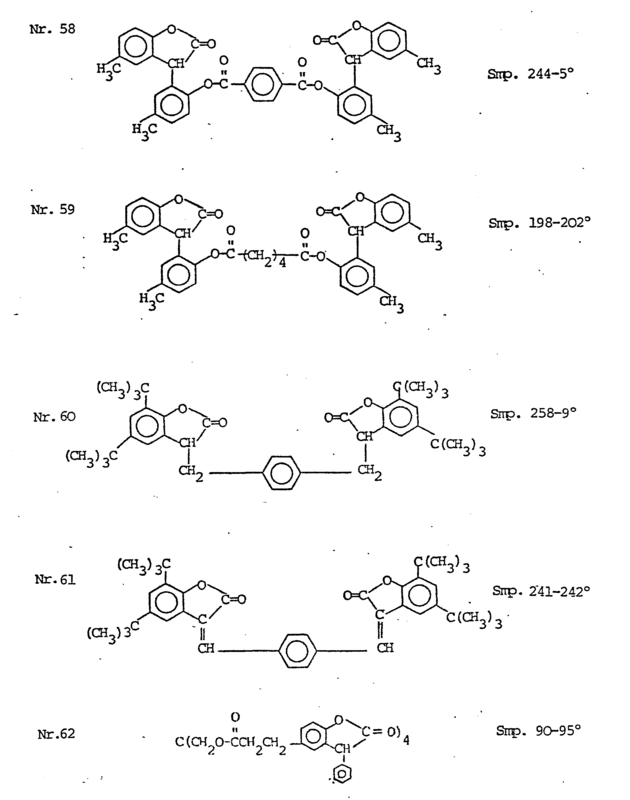 (2) 11 Polymeric organic materials comprising a benzofuranone (2) compound and / or indolinone compound having in the 3-position either at least a hydrogen atom or a bound via a double bond organic radical and / or optionally substituted bis-3-benzofuranone (2) compounds and / or optionally substituted bis-3-Indolincn (2) compounds wherein the 3-position unsubstituted benzofuranone-2 (3H) CN compounds in the 5-position by tert no. have butyl sterically hindered hydroxyl and indolinone (2) compounds, in that its (1) nitrogen atom of hydrogen, alkyl or aralkyl and if only the 3-position carries a further substituents having these no Acetamidstruktur and when the polymeric material is a 3 includes acyl -benzofuranone (2) compound as a stabilizer, this is substantially halogen-free. 12. 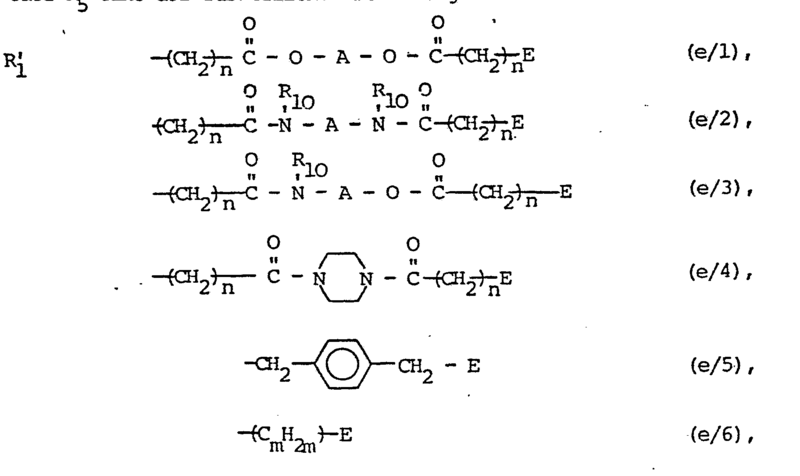 Polymeric organic materials according to claim 11, containing a compound of formula (I) according to claims 2-10. 13. A process for stabilizing polymeric organic materials against thermal oxidative, photo-oxidative and which occurs due to mechanical stress in the processing of polymer melts degradation, characterized in that in this a benzofuranone (2) compound and / or indolinone (2) compound in having the 3-position either at least one hydrogen breath or bound via a double bond organic radical and / or an optionally substituted to 3-benzofuranone (2) compound and / or an optionally substituted BIS3-indolinone (2) compound being in the 3- position unsubstituted benzofuran-2 (3H) -one compounds in the 5-position by tert no. have butyl sterically hindered hydroxyl and indolinone (2) compounds, in that its (1-nitrogen atom of hydrogen, alkyl or aralkyl and if only the 3-position carries a further substituent having this no Acetamidstruktur, introduced before, during or after the polymerization, wherein, when using a 3-acyl--benzofuranone (2) compound as a stabilizer, the polymeric material is substantially free of halogen. 14. The method according to claim 12 using a compound of formula (I) according to claims 2-10. Ccpolymerisate and ABS terpolymers according to claims 11-14. 16. 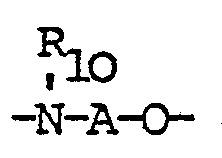 A stabilized polymer according to claims 11 to 15, characterized in that these polymers were prepared from a α-mono-olefin having 2-8 carbon atoms. 17. polystyrene, PVC, Ccpolymere of styrene and butadiene or styrene and acrylonitrile and ABS terpolymers according to claims 11-15. 18. Polypropylene according to claims 11-15. 19. Polyethylene hcher density (HDPE) according to claims 11-15. 20. A high molecular weight polyethylene (HMWPE) according to claims 11-15. 21, low density polyethylene (LDPE) according to claims 11-15. 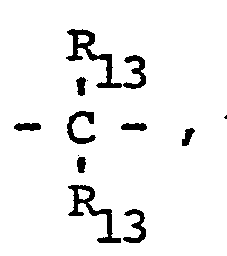 22, ethylene / propylene copolymers according to claims 11-15. 23. Polymeric materials according to claims 11-22 characterized in that they contain 0.01-5%, preferably 0.02-1% based on the material to be protected to amount of stabilizer. 24. Polyirere materials according to claims 11-23, which contain additional stabilizers and co-stabilizers. 25. Polymeric organic materials according to claims 11-24 which additionally contain either a stabilizer based on sterically hindered phenols or sulfur- or phosphorus-containing co-stabilizer or a mixture of a phenolic antioxidant and a sulfur or phosphorus-containing co-stabilizer. 26. A process for stabilizing polymeric organic materials according to claims 13 and 14 with the additional use of a phenolic antioxidant and / or a sulphur- and / or phosphorus-containing co-stabilizer. 27. Ground melting in claim 1 and claims 2-10 benzofuranone defined (2) - and indolinone (2) compounds zusaimen with known Antiσxydantien and a brightener, and optionally with known light stabilizers, metal deactivators, Nukleirungsmitteln and / or lubricants. 28 Vervendung the melt according to claim 27 for determining the additive content in the polymer. wherein X, R, R 1, R 2, R 3, R 4 and R 5 are as defined for formula (I) in the claims have the meaning indicated 2 and 3, and also the local limitations, with the proviso that neither a residual (aa / 1) nor a group (a / 3) is present, and imrer either R 1 represents a (e / 1), (e / 2), (e / 3), (e / 4), (e / 5), (e / 6), (e / 7), (e / 8) where e = e 1 or R + R 1 (zusaimen) one of the radicals (e / 9), (e / 10), (s / 11), (E / 12), (e / 13 or R 3 is a radical (e / 1), (e / 2), (e / 3), (e / 4) (s / 14) wherein e = e 3, and for (e / 14): R 1 = optionally substituted phenyl, or R 5 represents a (e / 1), (e / 2), (e / 3), (e / 4) wherein e = e 5 and n = 1, or (s / 15) where R 1 = optionally substituted phenyl. is reacted with piperazine: in a known manner or is (e / 4). is reacted in a conventional manner and hydrogenating the resulting intermediate catalytic. 33. 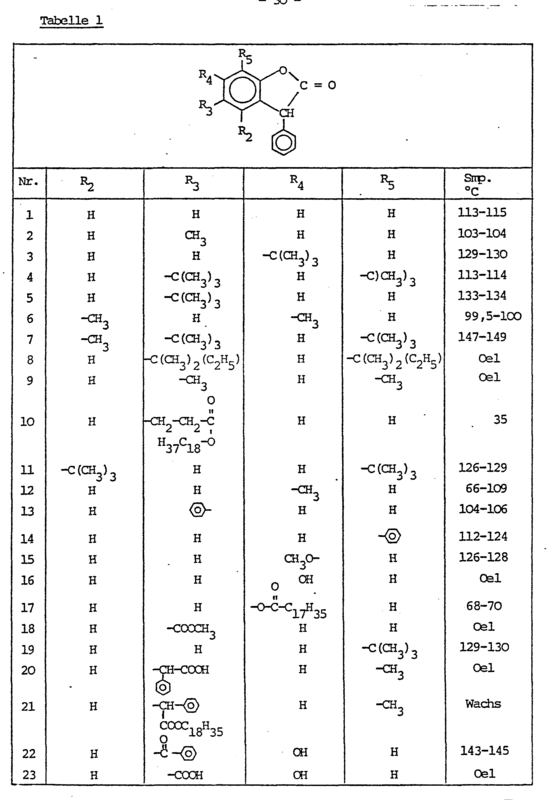 A process for the preparation of compounds of formula (II) according to claim 29, wherein R + R 1 zusaimen one of the radicals (e / 9), (E / 10), (E / 11) (E / 12), (e / 13 geiräss claim 3 are characterized in that a compound of formula (I) according to claim 2, wherein R and R are hydrogen, is reacted with the corresponding aldehydes of the bridge member. R 3a and R 5a have the meanings of R 3 or R 5 with the exception that no residual (a / 5) is present and in a allfällig present radical (a / 4) R 7, only hydrogen, and G is a secondary amine radical or halogen, heated with at least the equivalent amount of Cyanidiσnen and hydrolyzing the product obtained in the presence of water in a known manner and condensed with the phenolic hydroxyl group with elimination of water, and then, provided that R 7 may be different in the final product of hydrogen or the radical (a / 5) to be achieved, esterified with the appropriate alcohol or amidated the corresponding amine. 36. Means for stabilizing polymers, characterized in that it comprises a benzofuranone (2) compound and / or indoline (2) compound in 3-position either have at least one hydrogen breath or bound via a double bond organic radical, and / or optionally substituted bis-3-benzofuranone (2) compound and / or an optionally substituted bis-3-indolinone (2) containing compound, wherein (i) in the 3-position unsubstituted benzofuran-2 (3H) one compounds at 5-position no tert through. have butyl sterically hindered hydroxyl, (ii) compounds which indolinone (2), in that its (1) Stickstoffatcm of hydrogen, alkyl or aralkyl and if only the 3-position carries a further substituent having this no Acetamidstruktur and (iii) with the use of 3-Acylbenzofuranon (2) s is the polymeric organic material is substantially free of halogen. 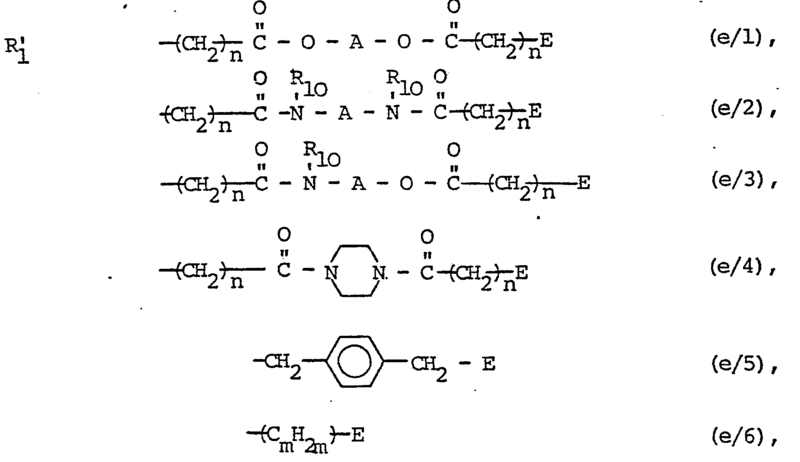 FR2678615A1 (en) * 1991-07-01 1993-01-08 Ciba Geigy Ag Benzofuran-2-ones thiomethylees, their preparation and their use as organic matter stabilizers. 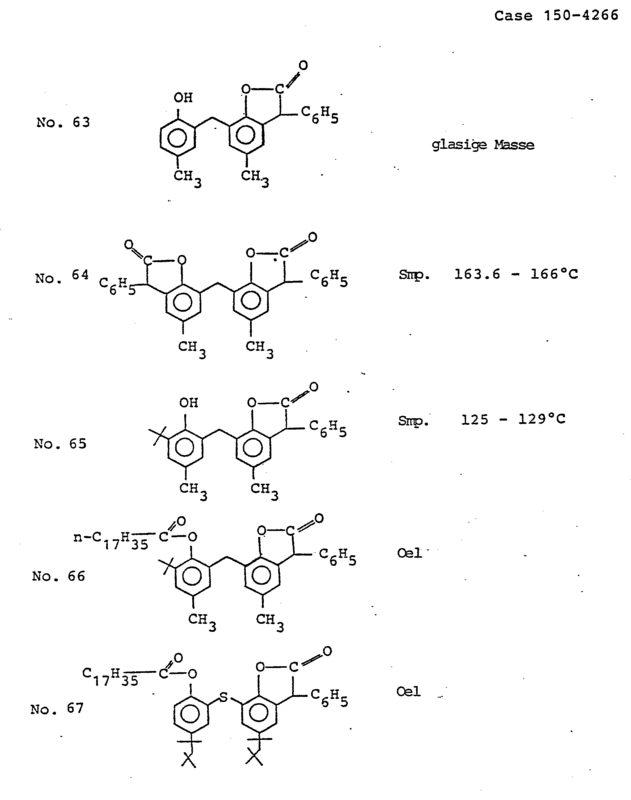 FR2678616A1 (en) * 1991-07-01 1993-01-08 Ciba Geigy Ag Bis (benzofuran-2-ones) and their application to the stabilization of organic materials. 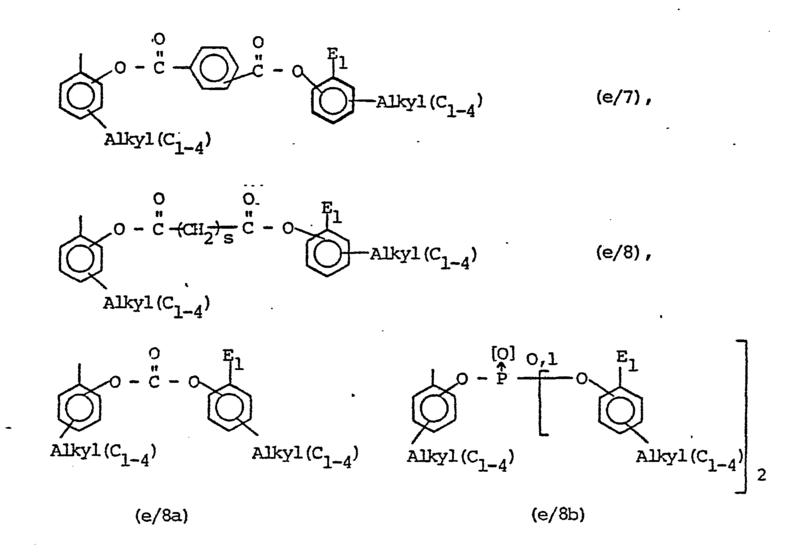 FR2691468A1 (en) * 1992-05-22 1993-11-26 Ciba Geigy Ag 3- (Acyloxyphényl) benzofuran 2-ones as stabilizers. FR2710063A1 (en) * 1993-09-17 1995-03-24 Ciba Geigy Ag 3-Aryl-benzofuranones, which are used as stabilizers, compositions containing them, and their use. ES2238839T3 (en) 1998-06-22 2005-09-01 Ciba Specialty Chemicals Holding Inc. Ultraviolet light absorbers poly-trisaryl-1,3,5-triazine. MXPA02002313A (en) 1999-09-01 2002-07-30 Dow Chemical Co Polycarbonate resin compositions comprising cyanacrylic acid ester stabilizer compounds. ES2247332T3 (en) * 2001-03-20 2006-03-01 Ciba Specialty Chemicals Holding Inc. fireproofing compositions. MX2012002245A (en) 2009-08-27 2012-07-03 Polymers Crc Ltd Nano silver-zinc oxide composition. MX2013005437A (en) 2010-11-16 2013-07-03 Basf Se Stabilizer composition for polymers. 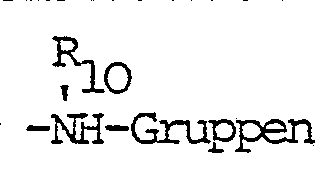 BE1005299A3 (en) * 1991-07-01 1993-06-22 Ciba Geigy Ag Bis- (benzofuran-2-ones) and their application to organic material stabilization. 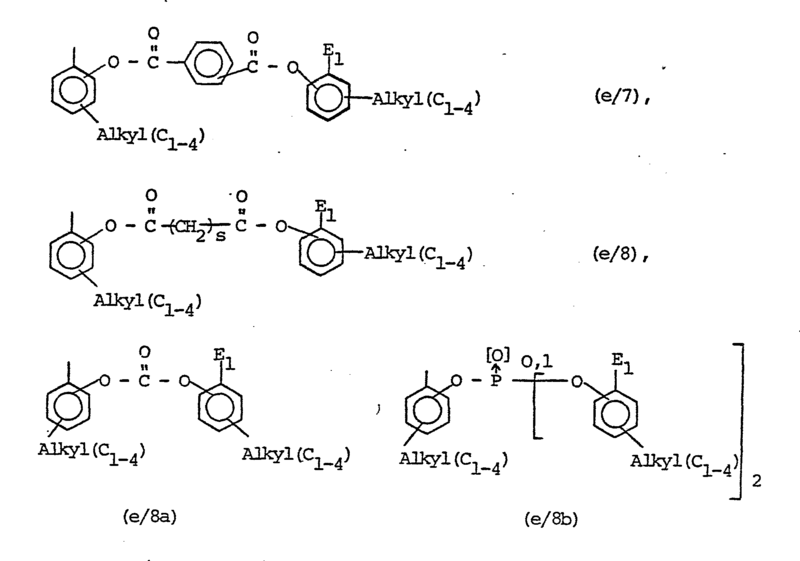 BE1006730A4 (en) * 1992-05-22 1994-11-29 Ciba Geigy Ag APPLICATION OF 3- (alkoxyphenyl) BENZOFURAN-2-ONES AS STABILIZERS AND COMPOUNDS OF THIS TYPE. 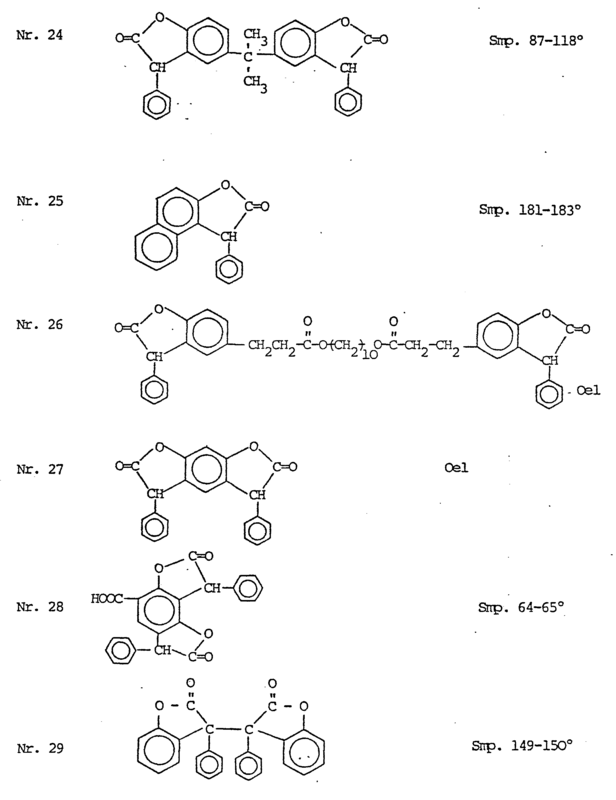 FR2691470A1 (en) * 1992-05-22 1993-11-26 Ciba Geigy Ag Application of 3- (alkoxyphenyl) benzofuran-2-ones as stabilizers and novel compounds of this type. 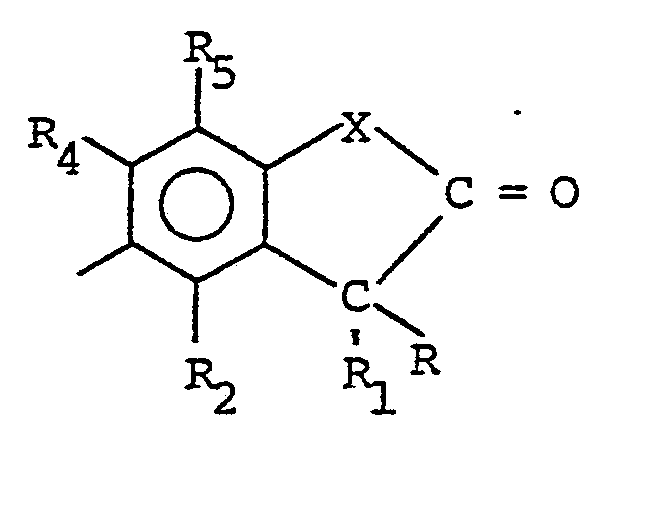 BE1007037A3 (en) * 1992-05-22 1995-02-28 Ciba Geigy Ag 3- (acyloxyphenyl) benzofuran-2-ones as stabilizers. 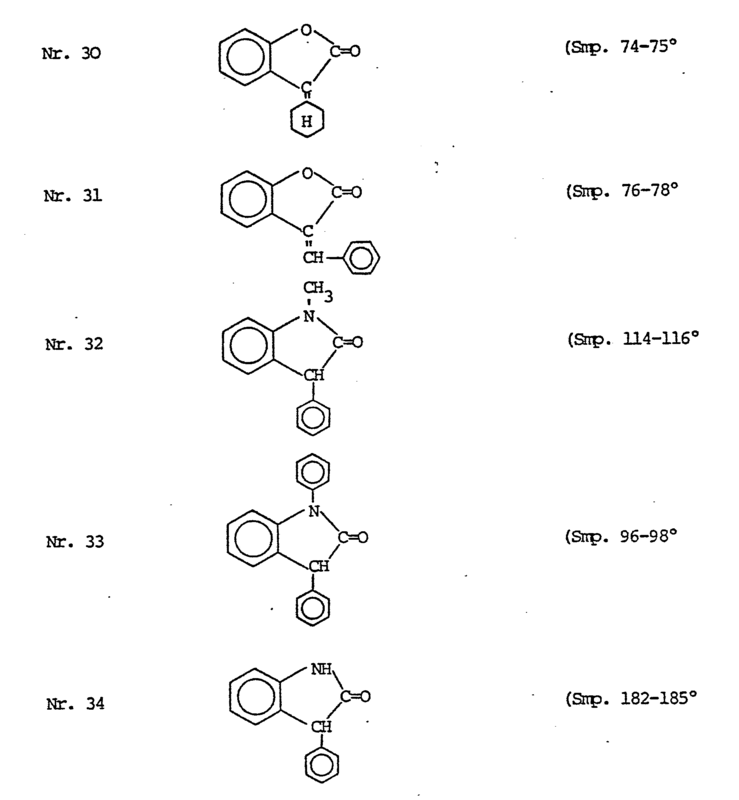 BE1008613A4 (en) * 1993-09-17 1996-06-04 Ciba Geigy Ag 3-ARYL-benzofuranones, USED AS STABILIZERS, COMPOSITION CONTAINING THEM AND THEIR USE. ES2149678A1 (en) * 1997-03-06 2000-11-01 Ciba Sc Holding Ag Stabilization of polycarbonates, polyesters and polyketones. BE1012881A5 (en) * 1997-03-06 2001-05-08 Ciba Sc Holding Ag STABILIZED COMPOSITION AND METHOD FOR STABILISING POLYCARBONATES, POLYESTERS AND polyketones.